Home Features Renault F1 Team Part III – What Will It Look Like? Renault F1 Team Part III – What Will It Look Like? Christmas is just around the corner, a time when presents are given out and unwrapped. It felt a bit like Christmas had come early for F1 fans this week too, when a whole host of F1 news was reported, shedding light on the near future of the sport. Power Unit suppliers, team names and even technical rule changes were announced, but probably the most exciting announcement was the return of the Renault F1 team as a manufacturer. It’s not exactly fresh news; the French Automotive company’s letter of intent to Lotus was signed in September. But still, the confirmation means that a) the grid for next season is starting to take shape, and b) staying with the Festive theme we can start unwrapping the E24/R36/whatever they call it, and see if we need to ask for the receipt. Here’s how Renault F1 cars have looked in the past. Back in the 70s, the rules of F1 said you could go for a 1.5-litre engine with forced induction (turbo or supercharged), or a 3-litre engine without, ie normally aspirated. This was an era of F1 dominated by the legendary Ford DFV engine. In 1977 alone, a ridiculous 27 teams plugged the Ford double-four valve in the back of their cars. As well as that, Ferrari and Brabham developed their own flat 12-cylinder engines, with BRM and Ligier creating V12 engines. Only Renault developed the turbocharged 1.5-litre turbo engine, and in the Renault RS01, the turbo era was born. Bathed in a yellow and black livery, the car looked fantastic, but looks can be deceiving. Life was tough at first. The car only started four races in its first season, and retired from all of them, earning a rather unfortunate nickname ‘the yellow teapot’ due to its steamy demises. First points appeared in 1978, and then, with the new RS10 model in 1979, the team took its first win when Frenchman Jean-Pierre Jabouille won the French Grand Prix on French tyres (Michelin) with French fuel (Elf). It was as French as a garlic baguette wearing a beret. The team over the next few years added flashes of white to the livery, diluting the super bright yellow somewhat. But while the vibrancy decreased, the cars kept getting better, and between 1980 and 1985, the team took another thirteen wins courtesy of Frenchmen Alain Prost and René Arnoux. Though the uptake was slow to start, turbo fever was now in full swing, and by 1982 Brabham (BMW), Ferrari, Alfa Romeo and Toleman (Hart) had all developed their own turbo engines. The 1983 French GP was a high point for Renault, with Prost and Eddie Cheever taking the first all-Renault front row. But the wins dried up in 1984, when virtually every car had switched to a turbocharger. With Honda and Porsche seemingly out-developing the French outfit in terms of performance, the works team ended their F1 adventure at the end of 1985, focusing on supplying engines instead. *Wiz Khalifa is in no way affiliated with Renault F1 Team and is probably unaware of it’s existence. With constructors’ championships in the 1990s – five with Williams, one with Benetton – Renault looked into the possibility of returning to the sport full-time, and in 2000, a deal was signed for Benetton Formula to become Renault F1 again in 2002. Benetton’s colour had always been light blue, so it was odd that the company did not replace this, but happily, the yellow was back – this time in a slightly less garish form than before. The luminous yellow of yesteryear probably wouldn’t have worked in the livery, and so a calmer mustard yellow went with the serene, swimming pool, Mild Seven blue. The first event of the year started off badly, with a double-retirement for drivers Jarno Trulli and Jenson Button, who both crashed out of the chaotic season-opener in Australia. The duo got better as the season progressed though, eventually finishing fourth in the constructors’ table. 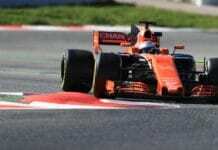 The next season brought Fernando Alonso into the picture, taking his first pole in Malaysia and winning in Hungary. A slightly more pronounced sky blue, with dark blue front and rear wings slightly altered the look for 2004, and would remain virtually unchanged for the next three years. The differences between the R24, 25 and 26 were all slight in appearance, and the latter two had identical successes, with one win for Giancarlo Fisichella, seven for Alonso, and both championships. This successful era marked blue and yellow as Renault’s sort of ‘winning’ livery, and I wouldn’t be surprised to see it come back in 2016. It’s no secret that Renault F1 team struggled in the post-Alonso era. The first season after the double World Champion went to McLaren saw F1’s perennial nearly-man Giancarlo Fisichella partnered by the blondest man alive; Heikki Kovalainen. They weren’t a bad pairing at all, finishing third in the constructors’ table with a podium for Kovalainen in rain-hit Fuji. However, the paint job was just kind of lacking. The Renault yellow remained, but in lesser proportion to the corporate blue colour that the French carmaker had decided to add in, as well as the orange highlights of new sponsor ING. With those three colours at their disposal, opportunities were endless. But sadly, the car was mostly white. The 2007 paintwork wasn’t awful, but in a year where the benchmark was set by the orange Spykers, it just didn’t measure up. Alonso’s return in 2008 prompted an upturn in performance with back-to-back wins in Singapore (after the team fixed the race) and in Fuji (where Lewis Hamilton and Felipe Massa collided on the first lap), but the livery didn’t change. On their own, these liveries could have been ace, but there were too many things going on, and the end product looked massively cluttered. 2009 brought Total red to the palette thanks to third (and eventual race) driver Romain Grosjean’s signing, but again, white was the dominant theme. After ‘crashgate’ was revealed, the ING logo left the car and was only hinted at with orange highlights, and the team gets my vote for the dubious honour of ugliest car of that season, because it looked a bit like a tractor. With ING out of the frame, Renault could afford to ditch their super-boring white and orange colours (which could have worked nicely if the emphasis was on the orange rather than the white) and go for something a little more retro. Based on the concept from celebrating it’s 30th anniversary in F1 from 2007, it was back to black and yellow. Behold the stunning R30, which took Robert ‘Bobby K’ Kubica to three podiums thoughout the year. The red Total accents were the only thing that bothered me about this car, as they didn’t really fit with the gorgeous yellow and black that looked so much like late-90s Jordan cars. While the car was covered in sponsor logos again, just like the year before, they were pretty much all black in colour, making the final product look a lot more put-together and thoughtful. In a season where, in truth, there were a lot of nice liveries (namely Mercedes GP’s silver and turquoise that somehow worked, and Virgin’s elegant black and red), the yellow stood out. Well, it would, because it’s yellow, like the colour of hi-visibility jackets. Guess that’s kind of the point. While Renault’s second bite at the turbocharged cherry went a little less fortuitously than it had in the past in F1, the team were making all sorts of strides in F1’s electric counterpart, Formula E.
As Formula E settles into the difficult second album, where car and component development has been allowed, e.DAMS Renault are the team to beat, after taking the constructors’ title last year, and with the company’s experience of being the old default powertrain paying dividends this season. The car itself has progressed from blue with a little bit of yellow detailing, to roughly half and half of each. With the yellow paths running around the sides of the engine cover almost identically to the cars seen in ‘the victorious era’ cars, I would bet money that some sort of blue and yellow get-up is on the cards for 2016’s F1 car. Maybe don’t mention it to Sauber though, eh? What do you think/hope the new Renault F1 team looks like? Let us know on Facebook, Twitter and Reddit! Next articleIt’s The 2015 F1 Oscars! Sainz – Targeting 4th amongst a tight midfield. Fast Fun with Felipe and Fernando!